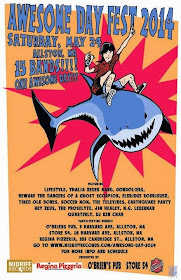 Jesse Sherman of Boston band, Tired Old Bones, and Cameron Keiber of boutique label Midriff Records, along with O’Brien’s Pub, Regina Pizzeria, Store 54 and Narragansett Beer present Awesome Day Fest in Allston Rock City on May 24th. 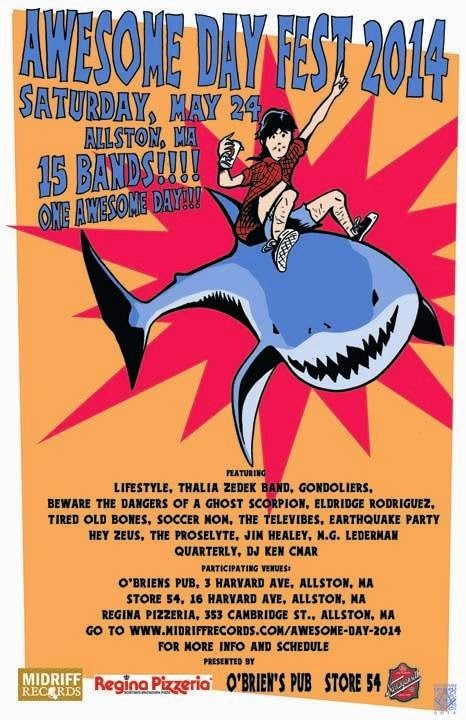 Originally orchestrated by Sherman, Awesome Day has historically been an all-day affair at the charming O’Brien’s Pub, complete with copious amounts of BBQ on the back patio and a stage full of the best rock Boston has to offer. This year, however, Awesome Day Fest transforms into a tri-venue experience with the addition of TWO MORE STAGES. Three times the music, three times the beer, just remember to cross with the crosswalk. And how much does it cost to attend said Festival of Awesomeness? Tickets to the O’Brien’s stage are $10 and can be purchased at the venue the day of the event. OB’s ticket price includes BBQ at while supplies last. Store 54 and Regina Pizzeria will have an encouraged donation policy for their performances on the evening of the event in lieu of a door cover. Please respect it. Additional details can be found at Midriff Records’ website and on the official Facebook event page. Cruel (Thomas Dolby/Eddi Reader cover) by Lifestyle featuring Sarah Rabdau You Are Released by Eldridge Rodriguez vs. Pizza by earthquake party!